What is this WMAppManifest file? The WMAppManifest.xml file is the file in a Silverlight application that holds the majority of the information that the Windows Store will use to publish and tell the phone what capabilities are needed to run the application (such as the store logo, pin to start logo, Title of the app, needing camera access etc..). This file is the equivalent to the Package.appxmanifest file in a regular Windows Phone application. Where is this silly file? So as all my readers know, i have been starting to develop windows phone apps. It’s been a fun ride so far. The typical bumps and potholes along the way as with any new framework (Windows or otherwise). As I’m finding little issues, I’m sharing them with my readers so that maybe you don’t have the same head banging experience I had/have :). This particular problem was a tough find and in fact, I found myself. There was no mention of where this stupid WMAppManifest.xml file is in a new Silverlight project. If you have done Silverlight in the past (which I did like 7 years ago), you can probably stop reading now, but if you found this article in your Google search, you are probably are as frustrated as I was. There were plenty of article out there on how to use it, but nothing on where it is in the project. 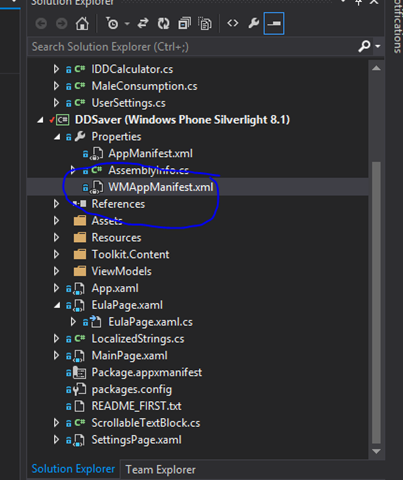 In a normal Windows Phone project, there is Package.appxmanifest file that holds all these same things and in fact, to make things more confusing, there is in fact one of these files (Package.appxmanifest) in the Silverlight apps that holds some of the information you need for getting the file ready for app store deployment (capabilities, Title etc…). it does not however hold any of the image information such as the logos capabilities (duplicated, but i have a feeling you actually need to fill this one out too), Title, Requirements and a few other things. This is in the WMPAppManifest.xml file. So where is it? It actually lives inside the Properties section where the AppManifest.xml and AssemblyInfo.cs always live. See image below. This entry was posted in .NET, C#, Classes, Computer Technology, Data Binding, Design Binding, Programming, Silvelight, Windows Phone, Windows Phone, Windows Store Apps and tagged .NET, C#, Silverlight, windows 8.1, windows phone, windows phone 8.1, windows store, windows store apps. Bookmark the permalink.